What work is being performed? The Florida Department of Transportation (FDOT) District Three is replacing the Pensacola Bay Bridge. How much does the project cost and who is paying for it? The design and construction cost of the project is approximately $398.5 million. The project is being funded by the Florida Department of Transportation. Can you describe the features and amenities of the new bridge? The new bridge will consist of two separate and parallel structures. Each bridge will accommodate three 12-foot travel lanes along with 10-foot inside and outside shoulders. The wider shoulders will make it easier to respond to incidents on the bridge, remove disabled vehicles, and keep traffic moving. Additionally, the new east and westbound bridges will include a 10-foot multi-use path that should quickly become a favorite for walkers, joggers, and bicyclists. Will there be any traffic impacts during construction period? FDOT and the construction team will endeavor to limit traffic impacts whenever possible. Temporary lane closures will not be permitted between 5 a.m. and 8 p.m. The United States Coast Guard (USCG) is responsible for marine traffic. The USCG will keep the public informed of any construction activities affecting marine traffic through the Local Notice to Mariners program. The notices are available here. What is the plan for the recreational areas adjacent to the bridge in Gulf Breeze? The wayside park on the east side of U.S. 98 in Gulf Breeze and the boat launch facility on the on the west side closed in March 2017. These areas will be used to stage construction vehicles and equipment and will be accessible only by construction and emergency services personnel. Plans call for constructing new recreational facilities at these locations. 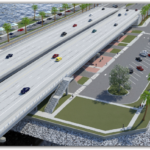 What is the plan for the recreational areas adjacent to the bridge in Pensacola? The wayside park and fishing pier on the east side of U.S. 98 is slated to remain open during construction. However, the area on the west side of U.S. 98 closed in March 2017. This area will be used to stage construction vehicles and equipment and not accessible to the general public. Plans call for constructing new recreational facilities in Pensacola. Who is responsible for the construction work? The construction project is being administered by the Florida Department of Transportation, District Three. Skanska USA Civil Southeast, Inc. is leading the design-build team. Eisman & Russo is providing construction engineering and inspection services in support of FDOT. Will there be a ferry service associated with the bridge construction? 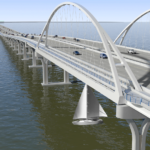 There will be no ferry system associated with the Pensacola Bay Bridge replacement project. However, the City of Pensacola is expected to begin operating a ferry system in 2018. This city-operated system is not a component of the Pensacola Bay Bridge replacement project. More information on the city ferry service is available here.